Domains International (Blog) | Domains Marketplace: Are you thinking to buy an EV domain? EVProviders is a name with about 7,160,000 results on Google search. Providers EV refers to all types of providers electric vehicles, batteries and stations for providing electrical power. 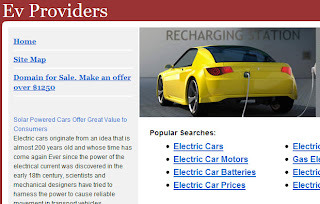 This is an area with great importance in creating a web site with this name because it allows not only the sale of products related to the theme (electric vehicles), but also with the same advertising related.